Dr. Johann uses the latest technological tools – in this case the T-Scan Bite Analysis System. 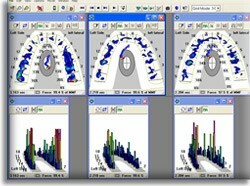 The T-Scan system from Tekscan is a hand-held device that connects to the dentist’s computer. You bite down on the thin sensor and the computer records your bite – including all movements – and provides the doctor with a series of images and graphs showing exactly what’s happening. With this wealth of information, Dr. Johann can design a personalized treatment to correct your bite and free you from pain.